I was a member of the Hove SCC unit from the late 1960s to the early 1970s, when the unit was based at the HMS Sussex RNR HQ at Maxwell’s Wharf. The unit met twice a week, typically Tuesdays for band practise and Fridays for class instruction. The unit was originally based at the former RNR base adjacent to the King Alfred swimming pool. I recall that the C.O. was Lieutenant-Commander Harvey and the 1st Lieutenant was Lieutenant Hayward. There were a number of instructors, Petty Officer Naylor, who left during the early 1970s, Chief Petty Officer Robertson, and later 2nd Officer Trevor Cox joined the instructors from the Merchant Navy. Other names I can recall are: Keith Parker, NickForest, Kim Siddal, Jim Kavenagh, Steve Flowers, Sullivan, Johnson, David Miles, Duncan McKenzie, Jeff Hart, Crump, Mocket, Heaton, Norris, and Stoner. Interestingly a number went into the RN via HMS Ganges, the boys training establishment. NickForest and Jim Kavanagh I knew because we were pupils at De La Salle College in Hove. In the early 1970s it was renamed Cardinal Newman, and later Newman. Some of us undertook the Duke of Edinburgh’s Award Scheme, with a number of unit members attaining the Bronze, Silver and Gold awards. Periodically, the Minesweeper HMS Curzon, M1136 (later reverted to her original name HMS Fittleton in 1976), was berthed at HMS Sussex. She was one of the “Ton” class minesweepers and not a sea tender. She enabled the RNR crews to participate in a number of fleet exercises over the years as part of one of the RN Mine countermeasures squadrons. Indeed, some of the unit members would also join the Sussex Division RNR when they were able to. 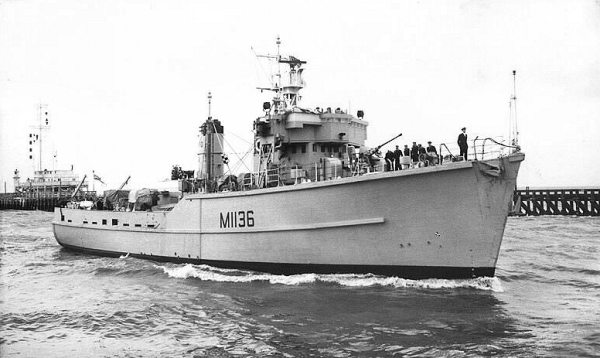 HMS Fittleton was lost in 1976 lost when she was in collision with HMS Mermaid during replenishment at sea. A small number of her London Division RNR crew died. She was re-floated and salvaged and later was sold for breaking at Sittingbourne. Interestingly the reasons why this incident occurred were explained to a number of us in a class when I was a Midshipman Officer in Southampton University Royal Naval Unit, in the late 1970s, whilst I was at college in Portsmouth. Over the years whilst I have been away from the south east, I would periodically meet old unit members, often by chance. NickForest was a PE teacher for a time at OakmeadsSchool in Burgess Hill. Kim Siddal plus son, I met at LindfieldPark. Crump I met at HMS Vernon the TAS school, when I was on a CCF course there in 1972. I met Sullivan, when we were working in a local manufacturing company in Portslade, in the 1980s. Jeff Hart, who played the cymbals in the band, I met in The Lanes and later again, by accident, when he was a drummer in the RAF band playing at Hurlingham in the early 1980s. In 2003 I moved back to Sussex after some years away, I often wondered what had happened to Hove SCC with the disbanding of the Sussex and Solent RNR Divisions in the early 1990s. I joined the South Coast Branch of the World Ship Society, and there I met up with Trevor Cox, now a retired teacher from Newman school who was for a time the units C.O. in the mid 1970s. He was able to let me know about what had happened to the unit over the ensuing years and I was pleased to hear that it is still functioning albeit at a different location. I look forward to the unit reunion in November 2007. Hello Geoff – Good to hear from you after all these years and thank you for your comments and details, and I will be contacting you. Interesting to come across this page. I was an ordinary cadet at HMA King Alfred in about 1969 (I think) and I don’t think I spent all that long there. I do remember PO Naylor, a happy decent fellow I think. I remember one evening they were bringing down the colours, or whatever the terminology is, and the light block and tackle the flag was attached to came away from its eye connected to the ceiling with an excessive tug – and just about missed MR Naylor’s head. We also went to HMS Collingwood which was supposed to be our first real taste of life in the Navy – it was hysterical. After lights out somebody came into our mess – in the pitched dark – and kicked every one of the brass rubbish bins down the middle on their way to the exit at the other end of the block. They just got out the door when we all burst into fits of hysterical laughter (we were like silly little girls really) and the door banged open again – next thing we knew was that we were doing several laps of the parade ground in our pyjamas – those that wore them. Although I was proud to wear the uniform, I always found pressing my bellbottoms a real struggle and eventually joined the Guards Brigade!! I didn’t know about the incident with HMS Curzon and was sorry to hear about the loss of life – not that I ever went on her – mind you the whole thing was like being involved in the Navy Lark with Lesley Phillips and Bill Pertwee – but, happy days! Trevor Cox. If he was a maths teacher, then he taught me maths back in the late 70s at Newman. He would spend hours talking to us about his time in the merchant navy (may have been the navy). I just remember it was much more interesting than maths. Hey, I love this site. I was at Hove at HMS Sussex, for a couple of years in the late 60’s early 70’s before leaving for Ganges. I managed a weekend or two in Curzon and will never forget her hull number. Sailed in the Mirrors and remember an amazing summer where we took the boats out on a sailing camping exped and got into trouble with the currents off of west wittering. Served in Hermes, Blake, Gibraltar and then moved to Canada. Got commissioned in Canada and recently retired as a Lt. Cdr. Have been looking for links back to Brighton recently and was glad to find this. i knew Charlie. I served on Curzon, went to Gib and many other trips. Would love to have a picture of us all on the forecastle around 1970. Baggy Baker, Roger Bladder, Cat Bros all there. Here’s hoping. Remember most of you, nice to hear you are all well. After I left the unit I spent two years in the R.N.R as a Leccy. My most endearing memory of the Curzon was when she ran aground in Falmouth Harbour. We spent some time in dock there getting repaired, going ashore carousing and not freezing our bits off sweeping. I joined the R.N in 1974 where I served 22 years in the Submarine service (P&O Boats). Now living in Gosport with my wife of many years. Good luck and fair seas to you all. Does anyone remember my dad an Able seaman Mr Eric Camps who served on HMS Curzon and was in the Naval Reserve from 1962-1967? He was at the Sussex Division, Hove battery 101. Does anyone remember what he did or got upto in his Navy days as I would like to know. He recently passed away due to having Parkinsons disease. To Tony Dury I remember Mr Trevor Cox at Cardinal Newman school, he taught Navigation but I was never in his lessons. I remember him in school as I attend there. I wonder if Trevor Cox knew my dad at all from his naval reserve days? Could you tell me if he did? If any fellow sailors who served with my dad are interested in attending his funeral it will be in a month’s time. Please get in contact johncamps04@gmail.com. Thank you.